The U.N. peace envoy for Syria will host senior officials from a range of Western and Middle-Eastern countries next month for talks on drafting a new Syrian constitution, the U.N. said Tuesday. He is already set to host a meeting on Sept. 11-12 at the U.N.’s European headquarters in Geneva of senior officials from the main foreign powers backing the project, Syrian government allies Russia and Iran, as well as Turkey, which supports some opposition groups. And on Tuesday, U.N. spokeswoman Alessandra Vellucci said de Mistura had convened a one-day meeting on Sept. 14 with senior representatives from Egypt, France, Germany, Jordan, Saudi Arabia, the United Kingdom and the United States. 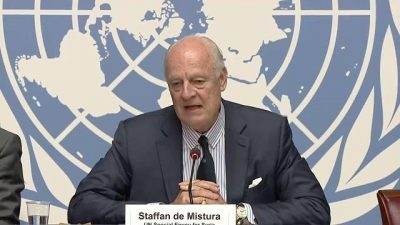 De Mistura’s previous efforts to negotiate an end to the Syrian conflict have achieved no breakthroughs.